The Department of Public Lands would be awarding homestead lots by November 2017, Homestead Division director Ray Salas told Saipan Tribune. The delay in drawing lotteries was due to the division prioritizing the identification of land interest associated with people who have applied for a homestead lot. According to Salas, the division has already identified at least six people who would be awarded a homestead lot but the department opted to wait until at least 20 people are identified for drawing. Salas added that those who have land interests associated to their name are already ineligible to participate in the village homestead program. 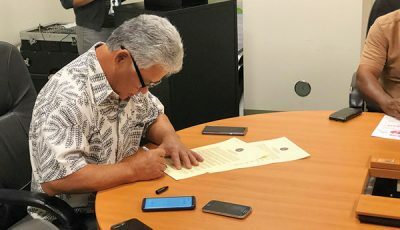 “Most of the applicants are off-island, so we are reviewing by year,” said Salas, adding that the division is currently reviewing applicants of January of 1992. “We have 40 vacant lots now,” he said. The lots are located somewhere in Kagman II and Kagman III. “Hopefully we could come up with 20 people by the end of [October],” he added. The most recent homestead drawing was in early July 2017, when DPL awarded nine people with village homestead lots. During that time, Salas said there were 275 remaining applicants for 1991 and 387 remaining applicants for 1992.